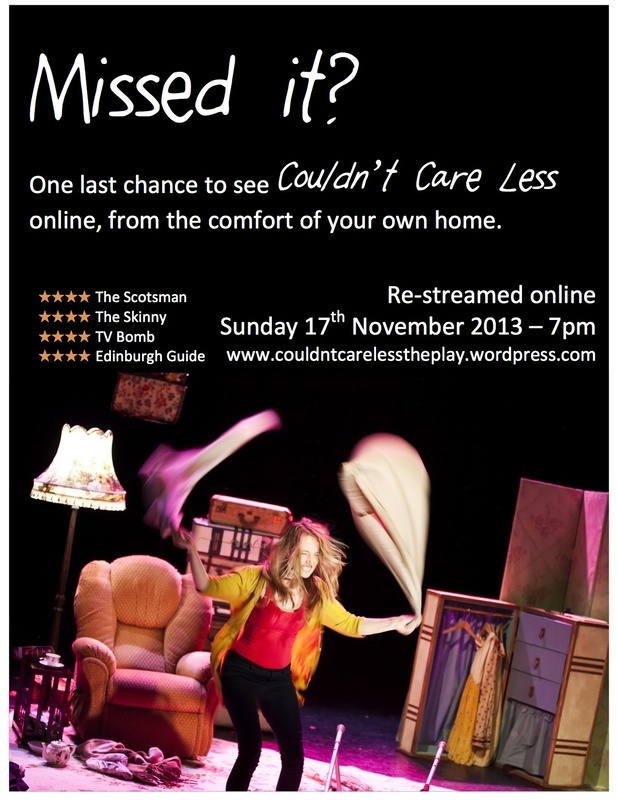 One Last Chance to see COULDN’T CARE LESS! 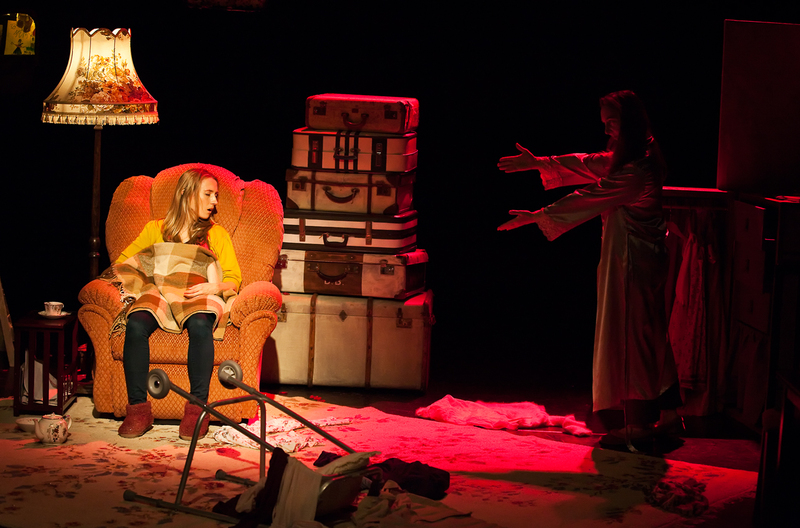 We had a fantastic time all across the country, sharing our play with fantastic audiences from Edinburgh to Buckie, Inverness to Dunoon… Thank you all for your support and for helping spread the word. We know some of you had technical issues when trying to watch our live-stream of the show. These were unexpected and unfortunately it did mean that some parts of the show were missed by those viewing at home. Thankfully, we’ve managed to arrange a “re-stream” of the show, which will be online on Sunday the 17th October 2013 at 7pm. 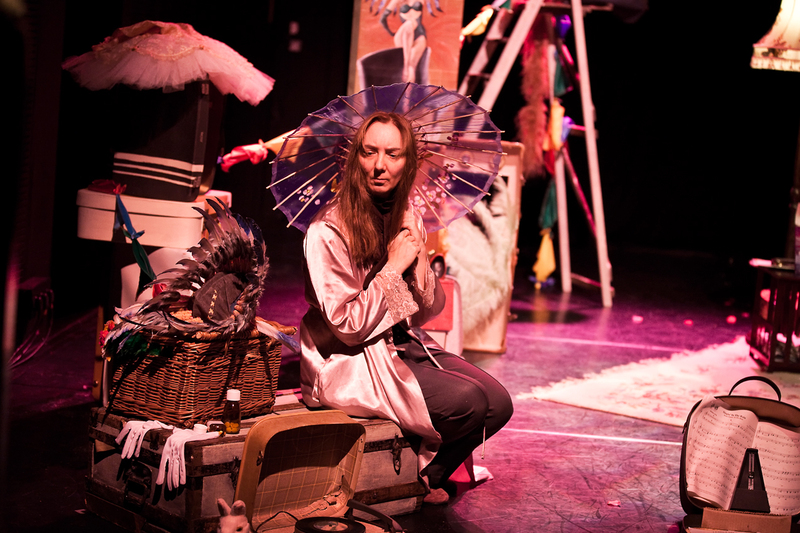 Tonight, we present Couldn’t Care Less to the public for the first time at the North Edinburgh Arts Centre. It’s been a busy, stressful week and much about the show has changed, so we can’t wait to welcome you at one of our venues across the country. After the show, it’s time for a well deserved drink for our team! We’re deep into technical rehearsals at the North Edinburgh Arts Centre for Couldn’t Care Less. Technical rehearsals are where the show comes together – after weeks of rehearsing in a room with no lighting, limited set and basic sound, the technical rehearsals are where we add all those elements to the show. They can be long, repetitive, stressful and frustrating – this is the first chance that our talented designers and technicians really get a chance to do their stuff, after weeks of planning and designing. It’s often difficult to stop focussing on tweaking the show, finding new elements and refining the acting in order to focus on the technical elements of the show in the very limited time we have. It’s important, especially when touring a show, that we get it right this time, as soon enough our company will be on the road, and will have to get everything ready and set up in just 4 hours. There’s a few more long days ahead, and then all of a sudden we’ll have an auditorium full of audience members ready to hear Lilly and Elspeth’s story! WATCH our brand new video trailer! Filmed by Ray Bird and Sam Baumber. Music by Danny Krass and The Underscore Orchestra. The last two weeks have been a bit foggy for me but I’m relieved to say that the fog finally seems to be clearing. We have lots of people working together to make our play and all this different creative input is what’s going to help it be an amazing play, but it’s not easy when there are so many different elements and voices coming together in a creative process. Each aspect (story, text, set, movement, music, performance etc) relies on decisions made in the other aspects. So when one aspect changes others have to respond and sometimes it can feel like you change the same thing over and over, going round and round in circles. Slowly though all these things seem to come together and after a difficult couple of weeks that’s where we’re at now. We all care about this play so much. We care about every play we do but we feel a sense of extra responsibility with this one, to represent the situation of a carer and person with dementia with integrity and humour. This is a delicate thing to do with so many decisions to make and tensions inevitably run high when you care about something so much. Over the last couple of days we have finally confirmed most of the text which is a huge relief to the performers who can now start learning it. We are still to decide on the ending of the play but as of yesterday this too is starting to become clearer. With only one week to go until our first performance we are both excited and terrified! Our Creative Assistant Melanie Jordan gives us an insight into the rehearsal room, during a session with our choreographer Malcolm Shields. Malcolm is a choreographer and movement director – his recent work includes choreography for the Royal Lyceum Theatre, The National Theatre of Scotland, Scottish Opera and the National Theatre, London. After a Rocky-esque warm up the CCL team were ready to jive! However, before split-leaps and lifts, the first step was to find the impulse between you and your partner, the complicity. This is the inner ‘nod’ of when to start, stop or change the rhythm; a little spark connection and understanding between performers that the audience only really notices when it’s not there. In my opinion, building complicity between performers is just as important as learning choreography and text, it brings these elements to life. Next, led by the production’s choreographer, Malcolm, we spun, ball-changed and octopus-ed until small routines were starting to take shape. I had great fun as dance assistant – which meant being spun across the floor while Malcolm demonstrated the moves to Liz and Hilde. And once you think you’ve mastered a simple routine as leader or leadee, swapping roles can really throw you out of your comfort zone! However, it is so important to know what your partner is doing. The more understanding you can have of your fellow performer’s experience, the more the complicity between you can deepen. So in dance, this means you know the next move of your partner without following any particular choreography; you understand what a certain hand position or foot tap indicates. This keeps you in sync with each other, and keeps your toes from being stepped on! In theatre, this connection between performers keeps the text alive and present, as if being said for the first time, playful, ready to spring off in any direction at any moment. It is tempting to block movement too early, to complete scenes like checking off a list. Of course, rehearsal schedules and budgets are tight, this can put the ‘fear’ in directors and performers to finish the show as performance dates grow closer. However, building complicity is like building foundations for a house, the final construction would crumble without a strong base. Tim’s direction is giving lots of time and respect for developing the maternal relationship between Liz and Hilde before solid decisions are made with Malcolm’s movement and Morna’s text. And of course in a company made up predominately of theatre clowns, there is always room for play! It was great to see Liz and Hilde dancing together, the mum and daughter relationship with all it’s complexities is becoming very strong. At times I didn’t know who was leading the movement, the more dominant role kept switching between the two, influencing the direction and tone of the movement. (Malcolm informs me this is called ‘hijacking’ in the ballroom world: when the person who isn’t leading steals the lead). Of course, the performers feel the impulse to change the direction of the movement, but to those watching it seems fluid, natural and almost accidental. This role-reversal seems particularly poignant to this story where care-giver becomes care-receiver; where mother and daughter must relinquish the control they thought they had over their lives, accept the present moment for what it is and allow themselves just to be. Refresh the page to view our re-stream!